Battersea Polytechnic, the forerunner of the University, was founded in 1891 on a site at Battersea Park Road and opened its doors to students on 6 January 1894. Its origins lie in the Polytechnic Movement at the end of the nineteenth century which set out ‘to promote the education of the poorer inhabitants of the Metropolis by technical instruction, secondary education, art education, evening lectures, or otherwise and generally to improve their physical, social and moral condition.’ It remained in Battersea for the next seventy years or so, growing in size, spreading to incorporate a number of different sites in the area and becoming one of the new Colleges of Advanced Technology in 1956. Over the years it underwent a transformation in educational provision offering the young people who flocked through its doors the chance to study for degrees in a host of subjects from Chemistry, Physics and Engineering through to Hotel and Catering Management and Economics. By the early 1960s, thanks to the growth in the number of students and staff, the sites in Battersea, which included an old furniture repository, a primary school and further afield, in Putney, a former swimming baths, had become unsustainable and the decision was taken to look for a new home. On 9 September 1966, Her Majesty the Queen granted a Royal Charter for the founding of a new University in Surrey and over the next four years, staff and students made the move to the green-field site at Stag Hill in Guildford. Earlier this year, the University of Surrey launched an exciting new heritage project, ‘Remembering Battersea – Help us build our history’. The project aims to celebrate the legacy of Battersea Polytechnic and the foundations on which the University is built by recording former students’ memories, inviting donations of Battersea memorabilia and seeking the help of Battersea volunteers to identify and catalogue existing items in the University’s archives. A key part of the ‘Remembering Battersea’ project is the ‘My Battersea Story’ oral history initiative which is working to capture the individual memories and experiences of the Battersea alumni who are still with us, before that opportunity is lost for good. Sadly it is now too late to do the same for the students who studied at Battersea in the early years of the last century. And of course, many of the voices of those students and members of staff who fought in the First World War were brutally and prematurely silenced when they met their deaths during the fateful years between 1914 and 1918. Thankfully though, a number of the stories of this generation have been preserved both in the photographs and letters which have been lovingly treasured and passed on by their families and friends and in records kept by the Polytechnic itself. This means that we are nevertheless able to form some impression of what kind of men these students and staff of Battersea were. An invaluable source for the period is Students at War: the lost generation of Battersea Polytechnic 1914-18 by Jean Shail with Maureen Shettle which combines material from the University of Surrey’s own archives with records from the National Archives and the Commonwealth War Graves Commission to build a picture of the men and women who went to war during those dark years. 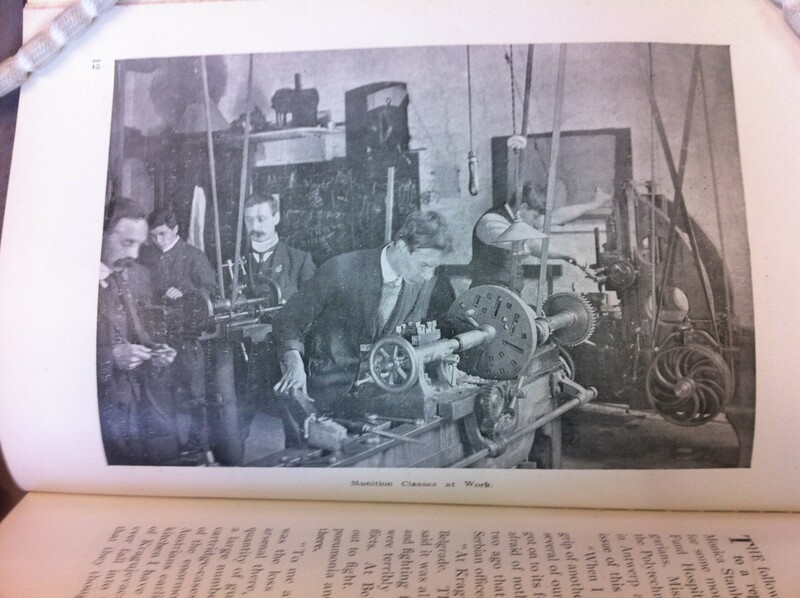 The first list of Battersea students and staff who signed up as volunteers to join the armed forces in 1914 was published in the Polytechnic magazine and featured two members of the Governing Body, ten members of staff and 203 students. Throughout the war these lists continued to be published and give the names of 650 men in total who fought on land, at sea or in the air for their country. From 1915 advertisements began to appear in the Polytechnic calendar encouraging students to enrol in the Officers’ Training Corps, ‘not only for their own good but for the great service which their doing so renders the community.’ A Polytechnic platoon was attached to the University of London Officers’ Training Corps and regular drills were held both at the University’s headquarters and also at the Polytechnic. Dr Sidney Rawson, Principal of Battersea Polytechnic from 1907 to 1915, encouraged the students who were going off to war to keep in touch and to write and send photographs and it is for this reason, according to Jean Shail, that so many of the records from the first two years of the war survive. The letters from these students provide a fascinating picture of the training regime they went through in the camps before departing for France with references to having to do patrol or guard duty at 2 and 3 in the morning, sleeping on a hard floor under a blanket or greatcoat and being set to building bridges, trenches and piers. Meanwhile the memoirs of Private George Wilson of the London Scottish provide more insights into the life of the ordinary soldier from his mobilisation in August 1914, through his arrival in France and movement from one front line to another, to his account of being shot in the eye and taken to hospital on a cart round Ypres. Having lost the sight in his eye, he was finally sent home to Scotland in mid November 1914. Lucia Creighton and Monica Stanley, two former female students in the Domestic Training Science Department signed up to work for the Red Cross in Serbia during the war. And Gladys Victoria King, another former Domestic Science student, was awarded the Military Cross for devotion to duty under shellfire while working at a hospital in France. Tragically, 78 of the Battersea students and staff who went to war never returned. Nearly all of them served with the Army. Jean Shail recounts many of the stories relating to their deaths in her book. Reading through them you are left with a strong impression of the many personal acts of courage and bravery and an overwhelming sense of the tragic loss of young men who had showed such promise in their studies and for whom the future had looked so bright. There is unfortunately not the space to include details of their exploits here, but the story of Frederick Henry Johnson, an engineering student who went on to win the Victoria Cross might serve as a fitting way to remember them all. Born in Streatham, Johnson entered Battersea’s Engineering Department as a day student in 1911. He went on to become Chairman of the Day Students’ Representative Council and editor of the Polytechnic magazine. He was awarded a first class honours degree in 1914 and at the outbreak of war, applied for a commission becoming Second Lieutenant in the Royal Engineers. After training in Bordon, Hampshire he left for France to join the British Expeditionary Force. He gained the Victoria Cross during the Battle of Loos when he took part in an attack on an enemy redoubt on 25th September, 1915 and continued on in spite of being wounded in the leg to lead several charges. He was repatriated to London for hospital treatment and received his medal from the King on 22nd December 1915. 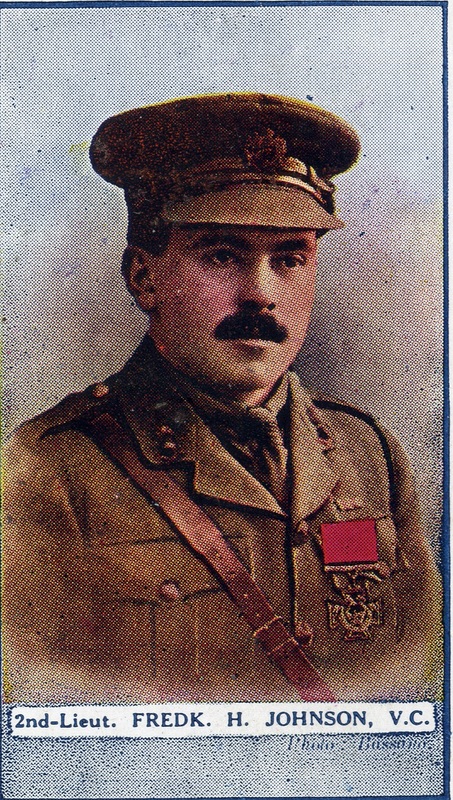 It was the first Victoria Cross to be awarded to a member of any of the Polytechnics. A separate presentation was organised the following year by the Polytechnic at which Lieutenant Johnson was given a portrait of himself which had been paid for by subscriptions collected from staff and students. Sadly Frederick Johnson did not survive the war. After returning to the Front and being promoted to the rank of Captain then Major, he was killed in action on 28th November 1917 having gone back to search for a comrade who had gone missing at the Battle of Cambrai. He has no known grave but is remembered on the Cambrai Memorial at Louveral in France. The names of all the students and members of staff who lost their lives during the Great War are inscribed on the Battersea Polytechnic War Memorial which the Polytechnic commissioned with funds raised by the staff and students themselves. Originally unveiled at the Polytechnic in July 1921, it was subsequently moved to the University of Surrey and unveiled in its new location by the University’s Chancellor, HRH the Duke of Kent in November 1989 – a fitting tribute to Battersea Polytechnic’s ‘lost generation’. To view items from the Battersea Polytechnic archives please contact archives@surrey.ac.uk or call 01483 689631.